The Board and staff of the National Coalition for the Homeless are heartbroken to share the passing of long-time organizer Michael Stoops. Michael passed away on May 1, 2017, due to illness incurred while recovering from a stroke. There will never be anyone like Michael, with his dedication to others, his tenacity, his quiet leadership and quirky humor. We all loved Michael as a mentor, a colleague, a brother and a friend. Michael began his career in the early 1970’s, after receiving his bachelor’s degree in social work. His Quaker community encouraged him to travel from his native Indiana to Portland, Oregon to assist veterans. This is where Michael found his passion for ending homelessness. He was a founding board member of NCH, and joined NCH’s staff in 1988. Since 1988, he has worked to establish and provide ongoing support to local/statewide homeless/housing coalitions, and homeless self-help and social justice/action groups. In 2004, Mr. Stoops took on the role of Executive Director of NCH. 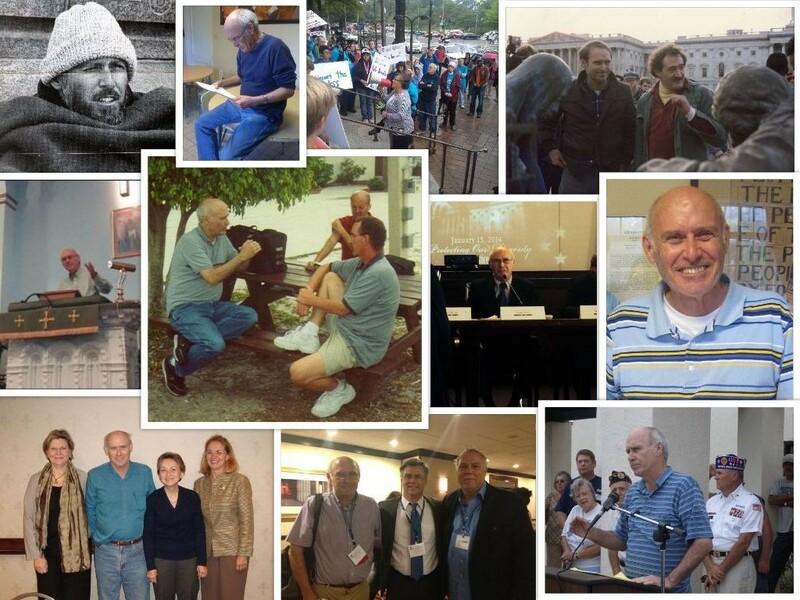 Working to mobilize NCH’s grassroots network, Mr. Stoops traveled nationwide giving workshops, providing technical assistance, and testifying before state and local legislatures. Mr. Stoops was one of the founding members of the North American Street Newspaper Association and served as Board Member of Street Sense, Washington, DC’s premier street newspaper. We will all remember Michael as a caring friend to each one of us. He has mentored us, and thousands of other advocates across the country. Michael could see potential, and did not waste time in getting us all to work. He has been steady, being the rock of NCH, through financial, political and personnel upheavals. Though he might have cut you short, he returned every call he ever received. He made time for each and every student doing research, for every mother crying because she couldn’t find shelter for her family, for every filmmaker wanting to make a difference, for each traveler who happened upon our office looking for help, and for every advocate looking for a way to fight for change. For many of us, Michael was a super hero. For the 10 years that I have had the honor to know Michael, he has worked 12 hour days, 7 days a week. We could never get him to go home to rest, and he would at most take off one week a year to go visit his family (stopping at shelters and visiting advocates all along the way). This is the Michael Stoops that we know, the Michael Stoops who we will remember lovingly, and the Michael Stoops who will continue to inspire us to work tirelessly until all of our neighbors, friends or family can sleep safely in their own homes. Rest in power Michael, we will keep the fight going. A Memorial will be held Thursday May 25, 2017 at 12:00p.m. at the Church of the Pilgrims, 2201 P Street, NW Washington, DC (map). A reception will follow in the church fellowship hall. In lieu of flowers, contributions can be made to the National Coalition for the Homeless. Memorial organizers would appreciate any photos or stories you would like to share. Please email them to info@nationalhomeless.org. As America’s poverty and homelessness crisis continues to escalate, men, women, and children across the country have resorted to finding shelter for themselves in the form of homeless encampments, known colloquially as ‘tent cities.’ There’s currently a six-digit shortage of emergency beds for those defined as ‘literally homeless’ by the Department of Housing and Urban Development, meaning that for many homeless individuals and families, there is no other option when it comes to immediate shelter. In January, the city of Honolulu agreed to refrain from disposing of personal property including tents, bicycles, clothing and household goods as a partial settlement of a federal lawsuit brought by the ACLU that alleged improper treatment of the homeless and others cleared from Oahu sidewalks. In June, the L.A. City Council approved nearly $950,000 in settlement fees and attorney costs for a pair of lawsuits charging that the city violated the civil rights of homeless individuals by impounding their personal property without allowing adequate time for people to separate out their medication and medical supplies. Earlier this month, Ponoma, California agreed to build 388 lockers for the property of homeless people and to stop enforcing three laws that prohibit tents, personal property and overnight sleeping on public property until sufficient accommodations exist, either in indoor shelters or open spaces designated for overnight stays. Finally, just yesterday Akron, Ohio settled a federal lawsuit involving how it removes homeless citizens’ belongings from public and private property, agreeing to change its policies and pay $20,000 in damages and court costs after police unfairly seized and destroyed homeless citizens’ tents, documents and other personal property in a series of raids. These and other legal victories are helping to change the conversation about homeless encampments from, “How fast can we get rid of them,” to “how can we better address encampments without ignoring the needs of homeless residents.” We still have a long way to go before the majority of the country recognizes the right of persons experiencing homelessness to exist in public spaces, but progress is being made. To learn more about the encampment closure crisis, read our report.